From the slight Essex scruffiness of Rochford, this walk leads quickly to miles upon miles of deserted, silent estuary, mud flat and creek, before cutting inland through the delightful pair of Paglesham hamlets – each with it’s own fine pub – and ending with a ferry ride to the yachting mecca of Burnham-on-Crouch. 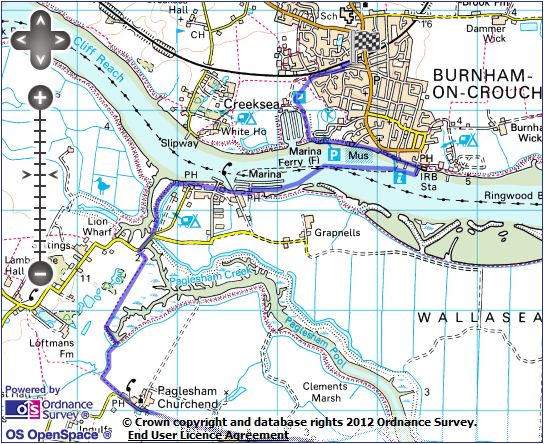 Important note: this walk can only be completed when the Wallasea Island – Burnham-on-Crouch ferry is running. In 2017, this is expected to be from Good Friday to the end of September, with ferries running on demand daily except Wednesdays – you will need to call the ferry operator on 07704 06 04 82 to summon the boat. 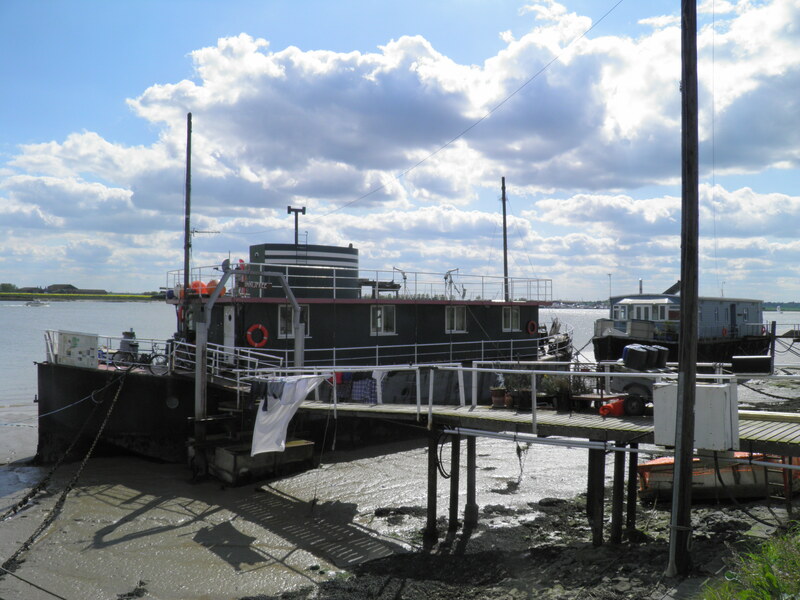 Details are on the Burnham Ferry website and short-notice cancellations due to weather are normally posted on the ferry’s Twitter feed – @burnhamferry. Underfoot: Whilst low-lying, much of this walk is on grassy levees, which tend to stay dry. A couple of field stretches could be muddy after very heavy rain. Terrain: You will barely encounter a contour line on this walk. 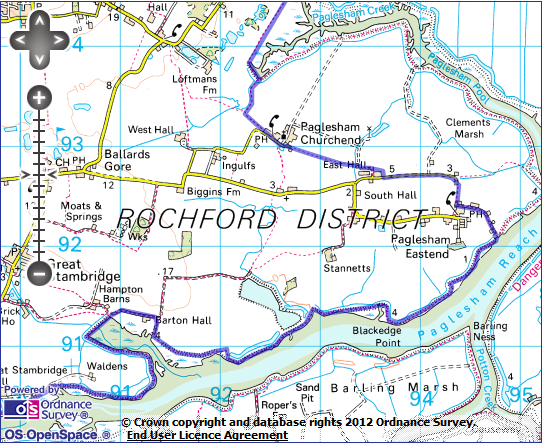 Maps: 1:50,000 Landranger 178 Thames Estuary and Landranger 168 Colchester; 1:25,000 Explorer 176 Blackwater Estuary. Getting there: Greater Anglia runs three trains per hour (two per hour on Sundays) from London Liverpool Street to Rochford (49 mins) via Stratford (42 mins) for London Underground, London Overground and DLR connections. 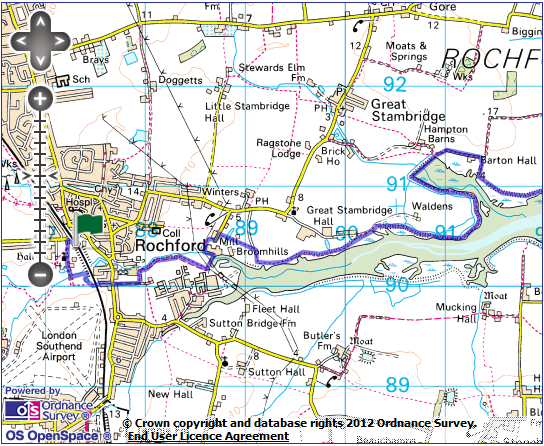 Useful websites: Parts of this route follow the Roach Valley Way, passing through the Paglesham hamlets. 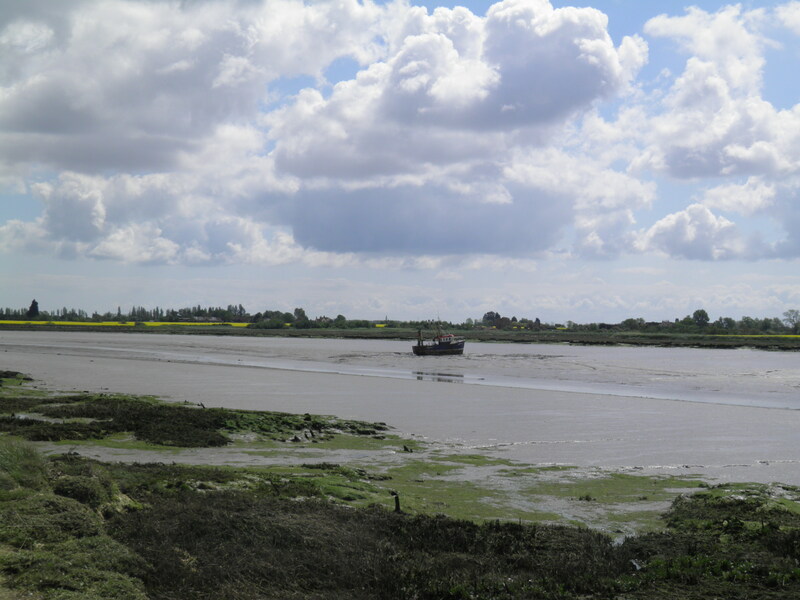 Boat trips to see birdlife and seals are available from Wallasea Island and Burnham-on-Crouch. Getting home: Burnham-on-Crouch is on the Crouch Valley branch line, and you will need to change trains to return to London. Trains run every 40mins (hourly on Sundays) to Wickford (26 mins) where they connect with services to London Liverpool Street (37 mins from Wickford) via Stratford (28 mins). Total journey time from Burnham to London is normally around 68 mins. Fares: The cheapest option is to buy a super off-peak return to Rochford for £12.90 (child £6.45, railcard £8.50). 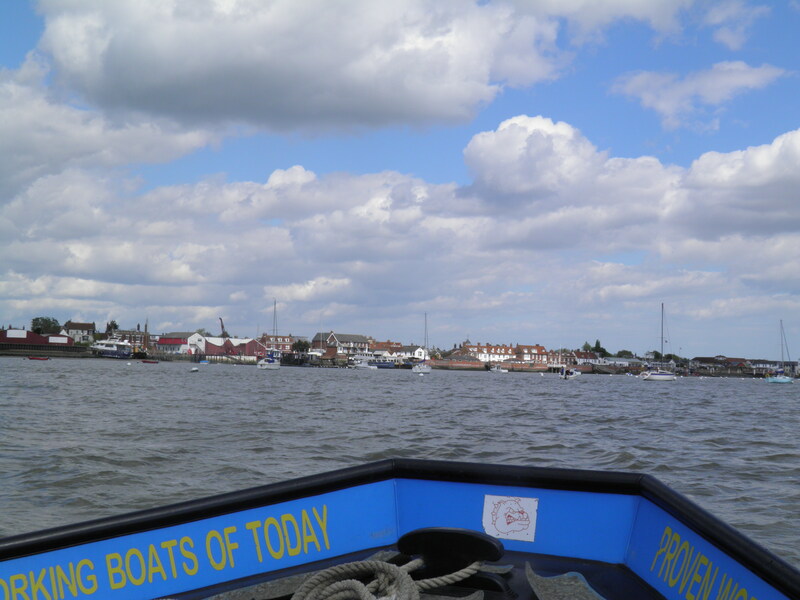 From Burnham, purchase an anytime single to Wickford for £5.80 (child £2.90, railcard £3.85). Your return ticket will cover the remainder of the journey to London. At weekends, Burnham’s ticket office is closed and there is no ticket machine, so you will need to buy your ticket either in advance and pick it up elsewhere or on the train. Arriving at Rochford on the train from Liverpool Street, cross via the footbridge to the London-bound platform and exit the station via the ramp. Turn left on the minor road past a Scout Base. 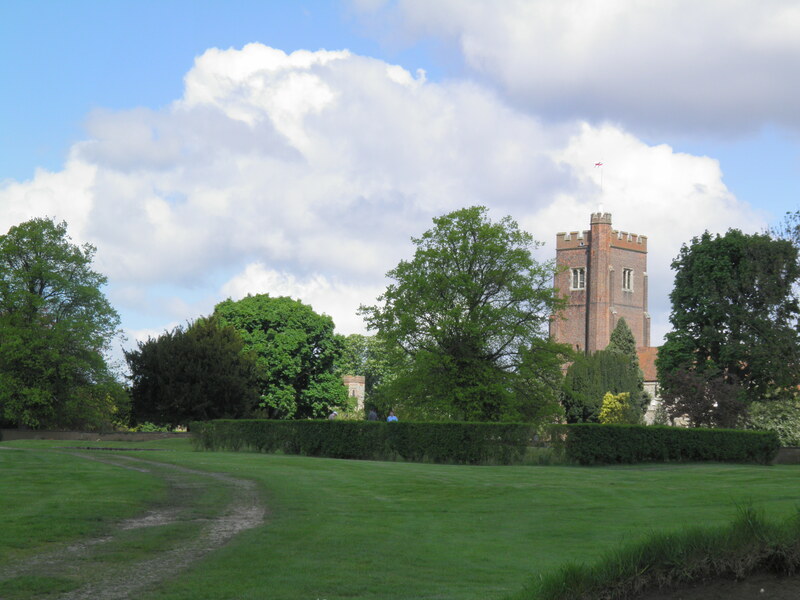 Emerging onto a golf course, Rochford Hall and St Andrew’s Church come into view across the greens to your right. foundation, though much of what you see today is the 16th century Hall that Thomas Boleyn, Viscount Rochford and father of Anne, inherited from his mother. It became the marital home of Anne’s sister Mary, and is supposedly where Henry VIII first met his future second wife. The hall later became the home of the Earls of Warwick. 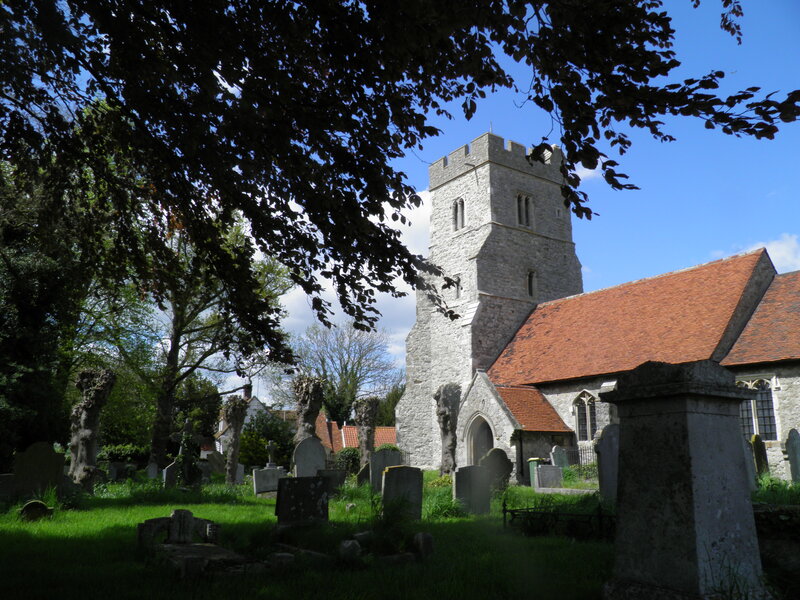 St Andrew’s Church, marooned in the middle of the golf greens, is mainly of fourteenth century origin, with the tower – one of the tallest in Essex – being added in the following century. Where the concrete track ends by a house, keep straight ahead beside the hedge (ignore the waymark pointing right). After crossing a stream follow the waymark to the left alongside it to reach the foot of the railway embankment. Here turn R alongside the line, past a small pond, just after which you turn left to cross the railway with care on a foot crossing. Ahead of you is the control tower of the increasingly busy Southend Airport. road at end and take little Tinkers Lane (with bridleway sign) opposite. Where the road veers left, keep straight ahead on a narrow path. On reaching a path junction by the corner of a fence, turn left to join a clear path beside the tiny River Roach, hidden here behind a low levee. Turn right here. Coming around a corner, you suddenly find the tall buildings of Stambridge Mills ahead of you. Keep straight ahead on a path, which soon curves left to a pair of metal footbridges over the sluice gates by the mill, at the tidal limit of the Roach. 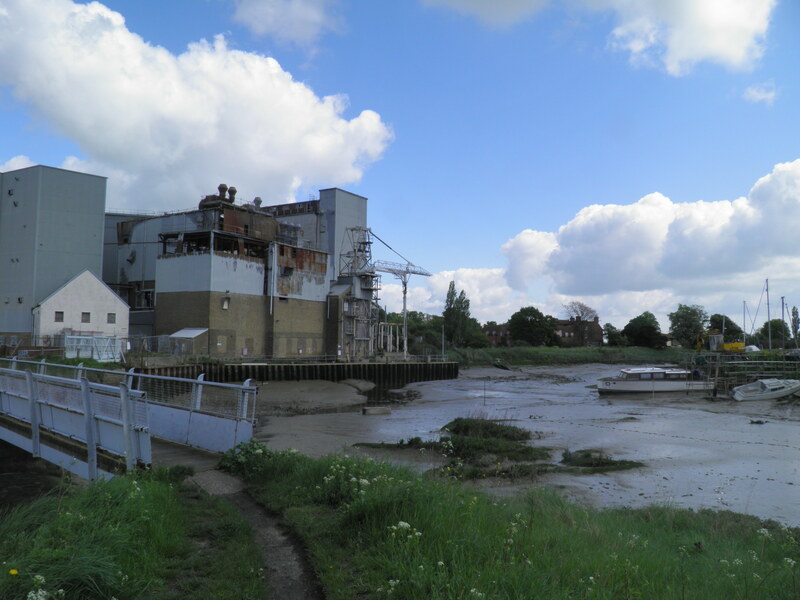 Stambridge Mills, at the head of the navigable river, has been a base for grain milling and transport for around two centuries, until the mid 1990s. The site is now proposed for a major housing development, which will retain some of the more historic buildings. This will lead to diversions of the right of way during and after construction. Follow the concrete path, which swings left around the edge of the mill buildings and then right along a field edge to a road. Turn left briefly and by the last house on the left, turn right at a footpath sign. Pass between a pair of fishing lakes and past a cricket ground. At a little tarmac road, cross and follow the path ahead between hedgerows. 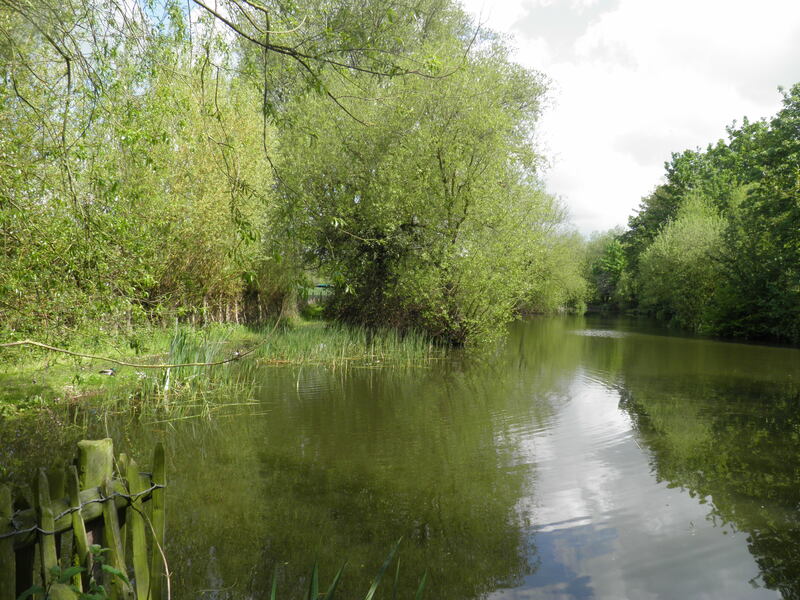 You soon arrive at the levee alongside the Roach – a broad river (or narrow channel amongst mud flats depending on state of the tide) unrecognisable from the little stream you were following a few minutes ago – and head left along it. Continue past the large farm buildings at Great Stambridge Hall and the whitewashed farm at Waldens, before eventually swinging left around the banks of Bartonhall Creek. The path runs around the head of the creek. As you come alongside the houses at Hampton Barns, follow waymarks left off the levee and onto a small road. Head right along it, past Barton Hall – or rather the farm that sits on the site of the long demolished medieval mansion. Just after the Hall, at a track junction, turn right (no waymark) back to the side of the creek, following the track as it swings left. At a small copse keep to the track ahead as it swings right through the trees, becoming a faint grassy track. Cross a causeway between two small lakes and then head left below the levee, following the line of drainage lakes. Past the end of these lakes, you get brief glimpses to the left of the dammed water of Stannets Creek, a popular location for waterfowl. Just beyond a gate, turn right up metal steps to rejoin the levee top, continuing east. 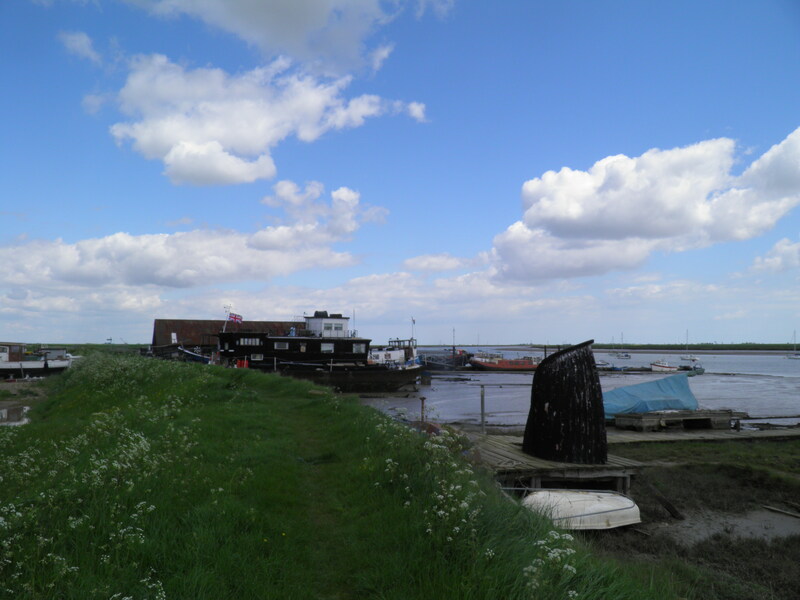 The levee twists around various small creeks to eventually arrive at the buildings and moored yachts at Paglesham quay. Follow the footpath sign left through the boatyard and across a car park to join access track past houses into Paglesham Eastend. To visit the delightful Plough & Sail pub, keep to this track where it swings sharp left after New Cottages. 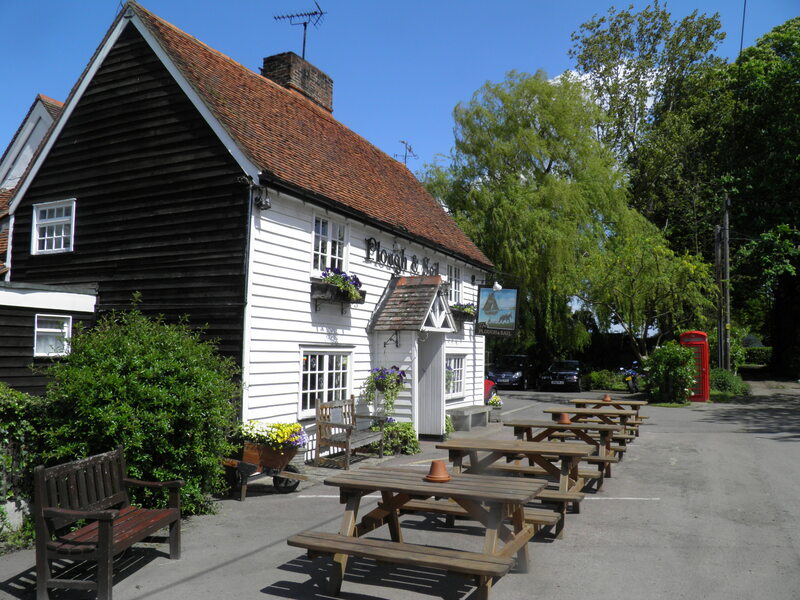 Paglesham is a sparsely populated parish covering the eastern end of the peninsula between the Roach and Crouch estuaries, made up of scattered dwellings, plus two distinct hamlets – Eastend and Church End, both of which surprisingly still retain their own pub. The Pagleshams were major fishing ports for many years, with oysters still being harvested here – as well as (perhaps inevitably in this lonely spot) being a mecca for smuggling. For many years, one of south Essex’s leading smugglers – who went by the name of ‘Hard Apple’ was even one of Paglesham’s parish councillors. Otherwise, follow a footpath sign right up a drive and through a footgate into open fields. You soon reach weatherboarded Well House, which sits at the end of a small road which you join, swinging left to head west. Across the fields, the roofs of Burnham-on-Crouch are now visible to the right. Just before a group of barns, follow a footpath sign to the right. The path swings round the back of the barns and then joins a track. Just after the track swings right, look out for a partially collapsed footpath sign pointing you left on a field path. Past some paddocks you arrive at St Peter’s Church at the end of the road in Paglesham Church End. Paglesham church was heavily rebuilt in 1873 by wealthy local oyster merchant Zachary Pettitt, though the basis of the church is much older, with the core of the chancel likely to be of Norman origin. Walk ahead, along the lovely row of cottages, to reach the tall, weatherboarded Punch Bowl Inn. Just past the end of the houses, follow a footpath sign right onto a concrete track around the edge of a huge field. Beyond an electricity sub-station, the route becomes a clear path beside a drainage channel. Climb the metal steps to the top of the levee at the head of Paglesham Creek and head left through a kissing gate. At the end of the levee, follow a waymark right on a clear path through the crops. 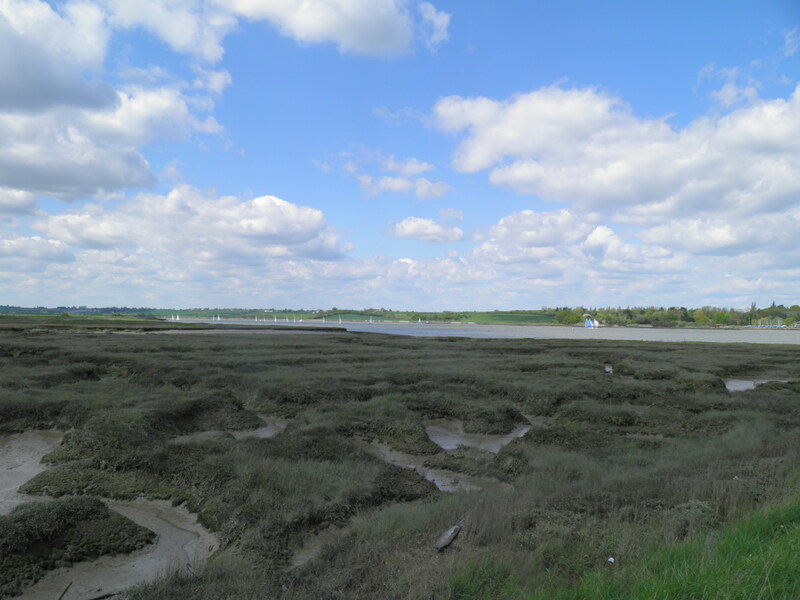 As the path descends very slightly, you get your first glimpses of the Crouch estuary ahead. At the end of the field, the path swings left on a low bank to a road, where you turn right. 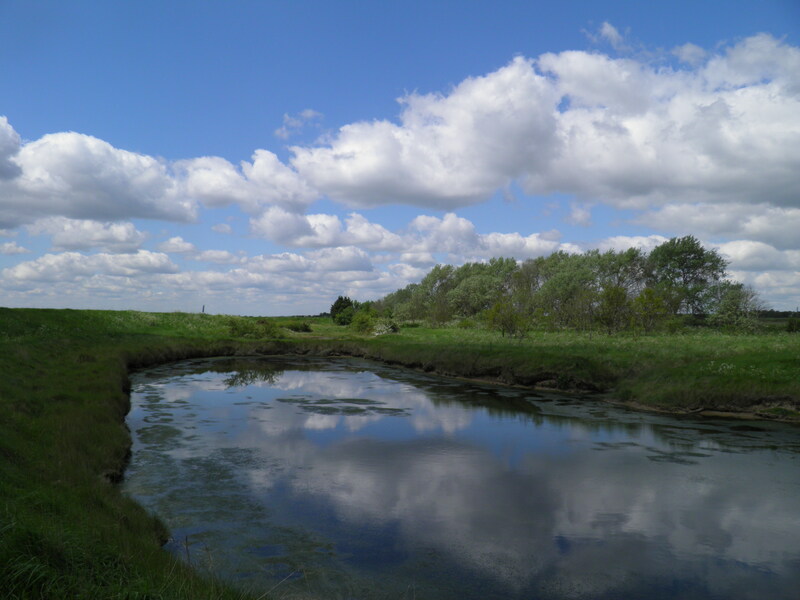 salt marshes, the levee reaches the main channel and runs beside it, passing the Wallasea Island camping site’s on-site pub. You are now on Wallasea Island, which is in fact a peninsula, linked by the narrow strip of land you have just crossed. It has long been an area of rich wheat farmland, with much marshland being reclaimed to create a Dutch-style landscape on much of the island, though since imports of cheap North American wheat created an agricultural depression in the 1870s the island became almost completely depopulated. Since 2006, there has been a gradual process of demolishing parts of the sea wall to create salt mashes and mudflats to re-establish wildlife habitats. Earth excavated as part of the construction of the Crossrail tunnels under London is now being shipped to Wallasea to contribute to wetland habitat construction. harbourmaster’s office to reach the final jetty. The ferry to Burnham-on-Crouch leaves from the bottom of the ramp. The ferry shuttles across the river during operating hours (see top of page) and the journey time is around 10 minutes. The fare is currently £4.00 per passenger. The ferry docks by the Anchor Hotel in Burnham-on-Crouch. Turn left along the attractive and mainly pedestrianised riverfront, passing more pubs and hotels. peninsula, originally growing up as a ferry port before becoming a major fishing port – again based heavily on oyster beds. As fishing declined, yachting has become a mainstay of the town’s economy. There are four well established yacht clubs here, including the Royal Corinthian Yacht Club, based in its listed 1930s ‘international style’ clubhouse at the eastern end of town. The annual regatta (‘Burnham week’) has taken place each August since 1893. The shortest route to the station is to take the main road out of town for around 1km, but this is a rather dull walk. However, if you are hurrying for a train, to take this route cut right at the war memorial and left along High Street to eventually reach the station. which soon returns to the river front, past the town museum and yacht club. Continue out of town, passing moored houseboats, until you reach the marina, where the path swings inland alongside the moorings. As you reach the top corner of the marina, take the surfaced path climbing slightly to the right. At a path junction, leave the clear paths and continue straight ahead across the grass, past a bench. Ignore the mown path at right angles to the right but take the next mown path heading diagonally right across the meadow. 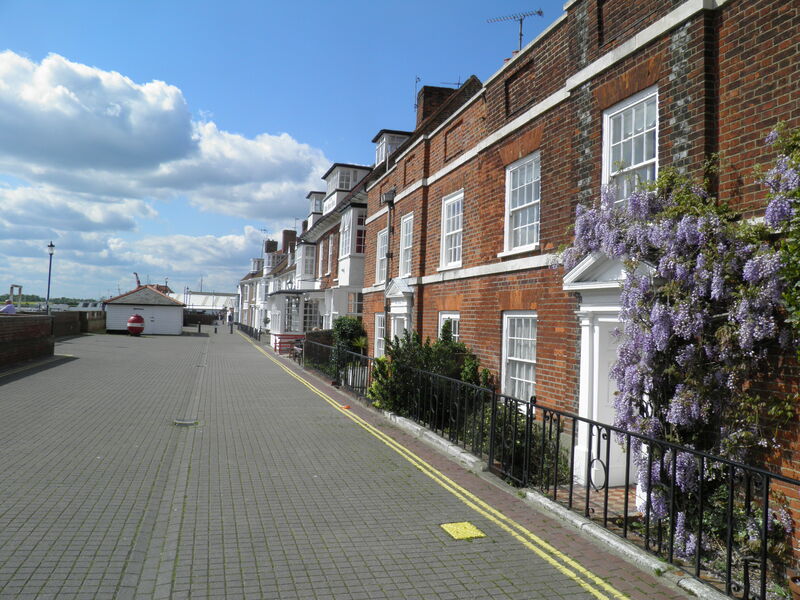 On joining a road at the corner of the houses, turn right along the pavement. After 300m, where the road curves right by a Jehovah’s Witness hall, turn left into the station car park and bend right to reach the station entrance.